Description This part is a genuine Xpelair 92755A Heavy Duty Mains or Battery Radio. Please contact us if you are not sure if this the correct part for your model. This part should only be fitted by a suitably qualified or competent person. 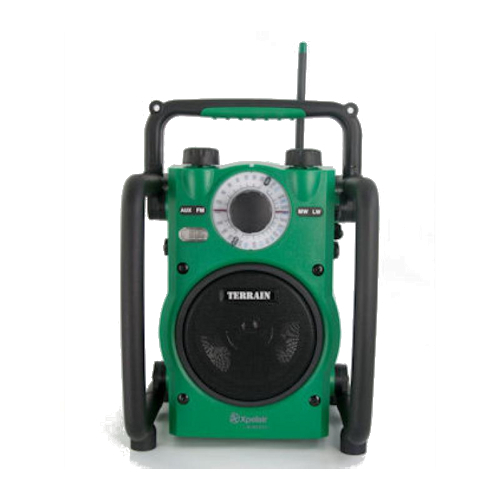 The new Terrain is a rugged, water resistant utility radio ideal for workshops, building sites, garages, camping, boating, or even back gardens. The specially designed 7 watt amplifier combined with a 6 ?? speaker provides more than enough audio to be heard in the noisiest environment. The microphone jack input also allows it to be used as a public address system. An ideal solution for anyone who is seeking a robust and reliable indoor or outdoor radio. - Size: w250 x h380 x d265mm. Please contact UK Spares on 01454 620500 with the model number of your Xpelair appliance if you are unsure whether this item will fit. This information will be printed on a data sticker which will be located somewhere on the appliance itself. UK Spares Tel 01454 620500 Fax 01454 620660.